Less than a week before Christmas, hopefully you have all your shopping done already. But what about yourself? Are you treating yourself to some fun entertainment? How about you have a Cheap Date? We’ll spend $30 on nerdy entertainment to fill your week. Enjoy! Hit the jump to read my recommendations. This is 40 is a sort of sequel to Knocked Up. Paul Rudd and Leslie Mann team up again to show us the funny side of turning 40. It has been a while since Judd Apatow directed a movie but from what I have seen, I think I will enjoy this. 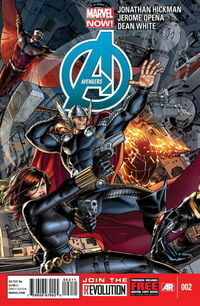 Jonathon Hickman continues to create landmark titles with his initial run on Avengers. Not to mention Jerome Opena’s art is anything less than stellar. Great team and great start to this Marvel NOW! series. We will finally see the original X-Men take on their current day counterparts in this issue as two Cyclops-es face off. Again another stellar team, this time with Bendis and Immonen, work magic for Marvel NOW! Rick Remender’s phenominal run on Uncanny X-Force comes to a close with this final issue before the Marvel NOW! relaunch of the series. How will Remender finish out the series? I can not wait to find out. Wonder Woman faces off against Orion of the New Gods. Now we will see how the New Gods will begin to affect the Old Gods and the DC Universe. The newest Green Lantern must answer to Guy Gardner, but they will be intertupted by the deadly Third Army. We may also begin to find out what actually happened to Hal and Sinestro.